Imagine, if you will, a world where cellphone cameras and SLRs get along. A world where one was never teased by the other. Imagine a world where Canon and Nikon lenses can be used as easily on an iPhone as they can on their own bodies. Now open your eyes and look around. How do you feel? Does anything look any different? It should, because the whole world just changed. Behold! The iPhone SLR Mount. The mount comes via those fine futurists at Photojojo, and takes the form of an iPhone case and an adapter. 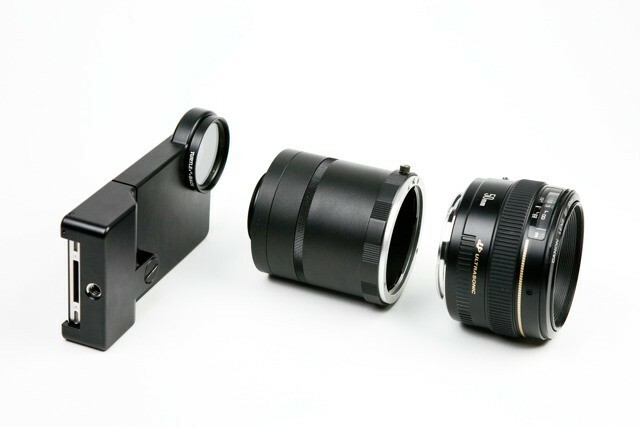 The case has a screw mount over the lens, onto which your Canon or Nikon adapter screws. Then you just bayonet your lens of choice into place. None of the auto features are preserved, of course, but if you can live with manual focus you’ll be rewarded with fantastic shallow-depth-of-field shots and all the other good things your collection of SLR lenses bring. The mount even had a strap mount so you can hang the lens around your neck. The rub is that this setup costs $250, and what you end up with is a novelty setup at best. It could be good for film makers I guess, but I don’t see how wrangling a big manual focus lens on a teeny, tiny camera body is easier than popping an Eye-Fi card into your SLR and beaming the results direct to your iPhone’s camera roll for processing. Still, I’d totally try one out. Both Canon and Nikon adapters are available now.